The audio album of MERSAL starring Thalapathy Vijay was held in Chennai on Sunday which the saw the cast and crew of the film in attendance. The audio launch of actor Vijay’s most anticipated film MERSAL was held on Sunday in Chennai amidst much fanfare. Admirers and fans of Vijay thronged the Nehru Stadium, where the event was held, and made the event a huge success. The audio launch of MERSAL was organised on a grand scale making it the first film in Tamil do so. The producers, Sri Thenandal Films, have been promoting the film aggressively to ensure that the film turns out to be a successful outing for them. 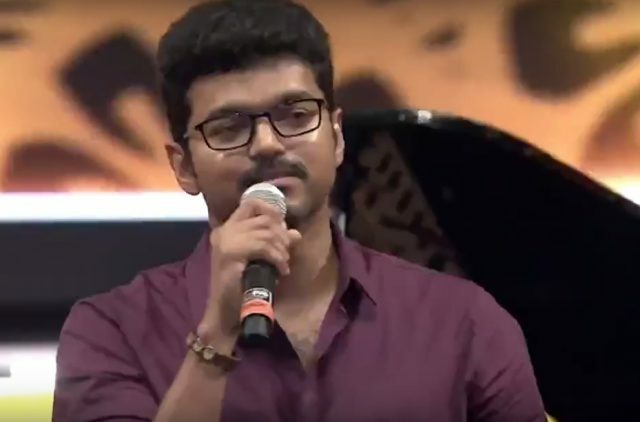 Speaking at the event, actor Vijay spoke about a lot of things including the recent trolling of a lady journalist online for voicing out her opinion about one of his films. “Ignore all negativity. The two things that decide a person’s fate are: his determination when he has nothing, and his attitude when he has everything,” said Thalapathy Vijay at the event giving out a strong message to his fans. Vijay also spoke about the film MERSAL, director Atlee and how much his fans mean to him. “Mersal is special for me. I admire director Atlee’s confidence and his ability to execute things. I’ve given hits and blockbusters but what I’ve truly earned is my fans,” said Vijay at the event. MERSAL is being directed by Atlee, who earlier directed Vijay in Theri, which was a super hit film in Tamil cinema. Besides Vijay, MERSAL also features Samantha Ruth Prabhu, Kajal Aggarwal and Nithya Menen in lead roles. MERSAL will have Vijay playing triple roles which will be for the first time in his career.